Actually, I do say this to clients where appropriate. The “plummeting income” warning applies in cases where a party has control over some or all of his or her income. Examples are cases where someone is paid on commission, is paid for voluntary overtime or is self-employed. Not all of these cases involve someone intentionally working less to deprive the other spouse of support (although, obviously, that does happen). Additional child care, stress and other reasons may lead to a reduction of income for legitimate reasons. It is not easy to differentiate the real from the manipulative, but that will have to wait for a different blog some day. In any event, warning clients about “plummeting income, is too narrow. In virtually every divorce, there is not enough money to go around. Most Americans spend every available dollar earned (and sometimes more). So, when a divorce occurs, there is rarely more income, but always additional expenses as there will be two rents or mortgages to pay, two sets of utility bills, and so on. Not to mention lawyer bills. The late chief judge of Milwaukee County, Patrick Sheedy (a great judge and person!) 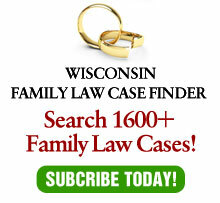 when he was on the family bench used to say that “there are maybe three couples in Milwaukee County who can afford a divorce and I don’t see any of them in court today.” Then, as a reserve judge, he was assigned to the case of Jane and Lloyd Pettit and I called to remind him that he finally had one of those three couples! Back to the point: The article is wrong. Good divorce lawyers not only warn potential clients about plummeting income, but about the larger picture of likely financial sacrifices which are part of divorce. While I rarely, if ever, advise clients of whether or not to file for divorce (that decision should usually be made in consultation with a therapist, not a lawyer who has a financial interest in the decision), part of the consideration needs to be the financial consequences. Good divorce lawyers are professionals and as professionals advise clients of all consequences, good and bad.